RSS is a very powerful technology, useful for anyone to gather and digest many information sources in one place — and even more useful for nonprofits to get their information out to their members and supporters. 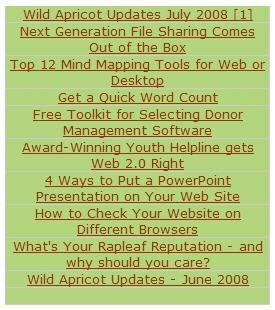 If you were to put all of your most important news sources onto a single web page, what a useful resource that could be! Remember when we mentioned the launch of Alltop.com, earlier this year? Alltop collects the most recent stories from the RSS feeds of selected sites, and shows the headlines as a link to the original story. Whatever your interest might be, one topic-specific news page lets you see at a glance the latest “top” stories in that subject area (e.g. http://nonprofit.alltop.com/). What if you could do the same kind of thing as Alltop — but hand-pick those RSS feeds of greatest interest to your organization and its members? Clubs could give members and the public an easy way to keep up-to-date on events as well as highlighting members with blogs. Any page with an RSS feed is content that could be served up on a news page. How might your organization use a custom news page to help your members feel more informed about your cause and more connected as an online community? Amit Argawal recently posted a clever tutorial for using Google Docs to create a custom news page at Digital Inspiration. It’s easy enough for even a spreadsheet novice to accomplish this, following Amit’s step-by-step instructions. Did you give a URL (website address) with a valid RSS feed? Check the website or blog for a “Subcribe” button and make sure that’s the address you’re using. Did you type in the code correctly? A missing comma or other small typo can often be overlooked by the human eye, but will cause an error in execution. Did you copy-and-paste the code, instead of typing it? If so, check to see if the plain quotes required for code were converted to “curly quotes” (smart quotes) in the process. If so, just replace the “ and ” characters with the ordinary “ marks straight from your keyboard. When you’ve got the spreadsheet calling up feeds to your satisfaction, and styled as you like it, publish the spreadsheet document (which makes it viewable by others) and embed the results in your web page — see Easy Embedded Tables for Your Website or Blog: Part 2 for more about embedding an interactive spreadsheet like this. Not everyone who uses the Internet is comfortable with using RSS and feedreaders, we know that. But even the least-savvy of Internet users soon learn to ‘Favorite’ a web page they plan to visit again. With a little thought and careful feed selection, your news page could be one of those web pages your readers will want to bookmark and revisit on a regular basis. You know, I have often thought about doing this, Rebecca. Thanks for reminding me about it again. Great information. While there are a lot of feed reading websites and apps out there, many of them can be very intimidating to novice web users. Thanks for the tip! Good point, Bryan. And if your organization can make a task (such as keeping up with the news) a bit easier on people, that's another way "give back" to your supporters and to build strong relationships online.